After Hoang and I slogged through the last section in a downpour, it was great to wake up to a picture perfect warm autumn day to enjoy the next few miles. 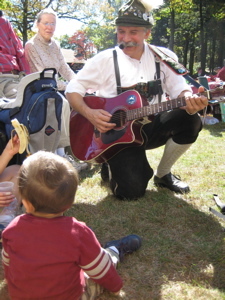 Especially since it was “Family Day” up at Heublein Tower – or “Octoberfest” as they call it – and our little Damian would be joining us. The trail up and over Talcott (aka Avon) Mountain and then down the northern and eastern slopes to Penwood State Park in Bloomfield is very familiar to me. Even before I moved to my house which is at the base of “The Mountain” (as it’s almost laughably known in these parts), I’d climbed up to the tower at the top numerous times. Since I’ve moved here, it’s become an extension of my backyard. 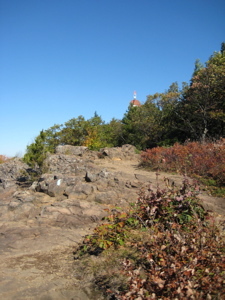 There was one time back in March or April of 2006 when I decided to burn some energy for an hour or so and took off for the Tower Trail. Once at the top and looking out on the Farmington River Valley, the skies opened up with a lovely 35 degree (or so) rain. The trail was already a muddy/slushy bog and the rain made it that much worse. The (hidden) sun was also setting pretty quickly on the east side of the mountain so I met up with and then jogged down the Metacomet with the intent of cutting over to where my car was at the bottom of the closed access road near Route 185. I found a swamp, of course and even fell a couple times over century old barbed wire fences for good measure. Anyway, Hoang’s parents had made a surprise visit to our house, armed with dinner and the idea of giving us a break from our newborn. “Where’s Steve,” they asked. Hoang told them I had gone shopping or something because really, who would tell their parents that the father of their 2 month old grandson was hiking in the cold, dark, rain. Of course, when I arrived home covered in half-frozen mud from my feet to my thighs – well, you get the point. I’ve been up there a lot, in many different conditions. And my inlaws think my shopping venues are very odd. 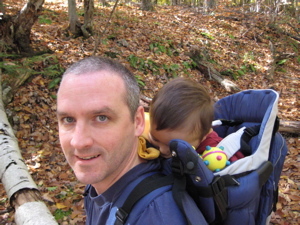 Our hike day in 2007 was infinitely nicer and I was excited to get out there. 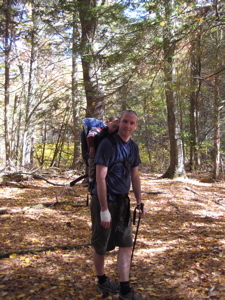 I had planned to meet up with Chris, keeper of the Nayantaquit Trail down in Old Lyme who found this website and corresponded with me as a result of my write up. The first CTMQ blind date! That’s not a scratch on your monitor. 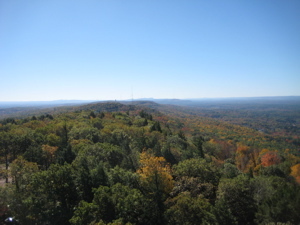 That’s Heublein Tower just left of center. 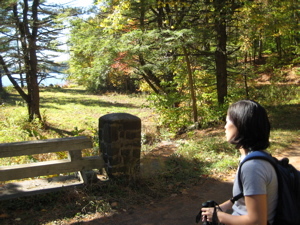 We entered the woods and curled around the northern tip of the reservoir, meeting up with the Metacomet at that point. Checking my watch, we were going to be late meeting Chris due to a miscommunication between Hoang and myself earlier in the morning. We had a little over a mile and a half to go – pretty much all uphill – and only 20 minutes to do it. Onward March! 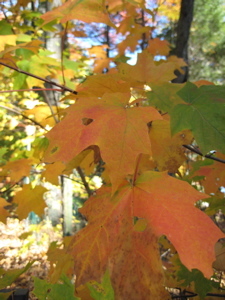 Now, I LOVE Autumn in New England – this year was a bit muted due to drought conditions all year, but it was still beautiful. The warm weather was a bit strange, but neither Hoang nor Damian were complaining. We were flying up the mountain on the wide, wooded trail. Hoang, suffering from an episode of heartburn, forged valiantly ahead behind me and Damian. For his part, he kept urging her along from his seat on high. There is a silly “Alternate Trail” for people to skirt the climb; I don’t care who you are, do not ever do this. The climb to the top is not hard at all and the views are – well, you’ll see in a bit. Hoang’s back there, chugging along. We passed a few hikers along our way, a couple that we simply blew by in our haste to the top. Once back up onto the ridgeline (which we left a few miles back due – I believe – to stupid rich people houses), we turned sharply north and found ourselves rock and cliff hopping yet again. There have been a lot of unexpectedly nice views along the Metacomet but this one was expected. I don’t want to diminish how nice it really is up there merely because I’ve seen it a million times. It is easily one of the best views in all of Connecticut, bar none. 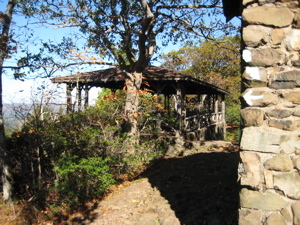 One of the pavilions on the way up the mountain, close to the tower. If you look very closely, you can see West Peak down in Meriden, near the Southern Terminus of the Metacomet. Beautiful. While I ran up to the top, Hoang hung out with Damian and the Oompah Band, drinking water and eating snacks. All credit goes to the two of them – we practically ran up the mountain and Hoang hung right with me, and Damian giggled all the while. She also met Chris who finally met up with me once I was back down the tower. 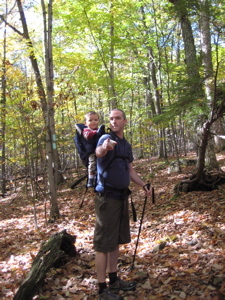 He was there with his family and we talked about CTMQ and hiking and agreed to do some trails together in 2008 – notably the end-to-enders down in the Eastern portion of the state. 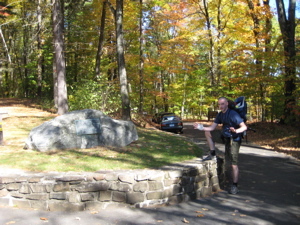 Great guy – who does great work, singlehandedly maintaining one of the “Connecticut 400” blue trails. So thanks again, Chris. We enjoyed the festitivities (nothing more than German beerhall music without the beer and food but no beer) for a good 45 minutes and then hit the trail once again. Here the trail splits with the infinitely more popular Tower Trail as it stays true to the actual ridgeline rather than the cliff edge. The Tower Trail is great though; there are benches all the way up for the out-of-shape to enjoy and something called the Hang glider cliffs which are exactly what they sound like. Straight shot down cliffs that nut cases jump off of. Hang gliding is one of those things – I imagine it’s fun as heck but how in the world do you do it that very first time? Alas we missed that excitement this time and paralleled the Tower Trail through some pretty cool flora. There are some severely weathered and stunted pines and hemlocks here, due to their exposed location, and I’ve eaten plenty of blueberries up there as well. (Not in October though.) It’s funny that no one takes this trail to the bottom – it’s certainly more technical than the Tower Trail but it’s far more interesting – save the cliffs. 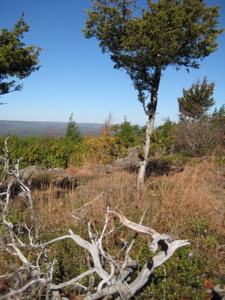 After summitting King Philip Mountain at 975 feet (I had no idea it was separate from the 1,040 foot Talcott Mountain) the trail turns East and begins descending. 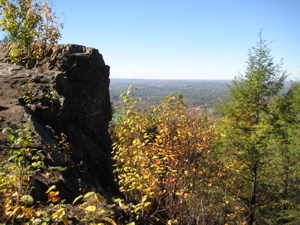 Wait – did I say the “1,040 foot Talcott Mountain?” THE highest point along the entire Metacomet Trail?! Indeed. Just 16 feet higher than the aforementioned – and hiked – West Peak down in Meriden. Writing this now, two months later, I am ashamed to admit that I didn’t celebrate with my highpointing wife in a proper way. The descent is funny in that it meanders quite a bit, contouring very widely back south before bearing east and then north again to Route 185. The old Metacomet used to go more directly but recent development (I think) has required the more roundabout routing. On the way down, Damian conked out – which is just amazing to me. Those backpack things are not exactly comfortable and we were going down, down, down, which results in lots of bouncing and jostling. I tried my best to not wake Damian, which meant walking in such a way as to cushion each and every step down the mountain. In other words: Quad workout! I succeeded and we reached our car in the Penwood State Park parking lot and called it a day. By that point, there were literally hundreds of cars up the access road to the Tower Trail and all over Route 185 and in the Penwood lot. Hey, good for the people of Connecticut, getting out and getting up a hill once in a while! 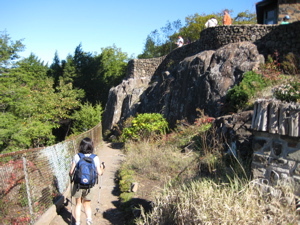 This section, our 10th, marked the end of hiking the Metacomet in 2007. 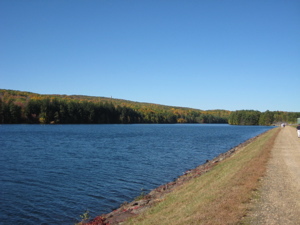 We have about 20 miles to go up to the Massachusetts border and since Hoang isn’t too keen on winter hiking, we’ll finish in the Spring – barring me convincing her of a winter hike. Ha! 4.5 Miles: Sharp right turn! It sure was a great day for a hike. Sunny sky, warm weather and great vistas. Cant ask for more then that… unless you have a “blind date” at the top, and I still showed up even after seeing your pic’s on the web pages…. As I told you in advanced… no beer at the Oktoberfest! and yes the parking lot fills up for this ‘fest thats why I planned on getting there early. At 10am there were 14 cars I counted, at 1:30pm over 100 just at the Heublein parking area. 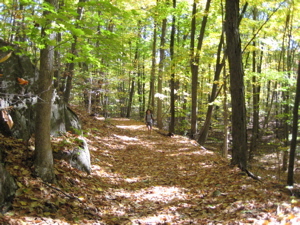 Thanks again for the plug and a link to my trail out in Lyme. 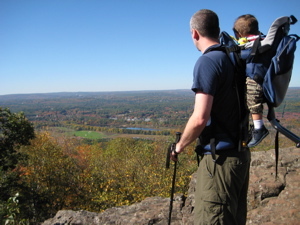 Did you ever finish hiking the last 20 miles of the Metacomet trail? Haha, no, not yet. Since it’s the only one I’m doing 100% with my wife, it’s a bit more difficult to plan. Plus, there has been an iffy/closed section in Granby for a while now. The trail’s not going anywhere. Thanks for the response, and for your writing. I’ve enjoyed reading your posts — and then following your hikes on foot. Hey, GREAT synopsis of the MC Trail. The best one yet! (even if it is the only one). Began hiking bits & pieces of the Trail this week. 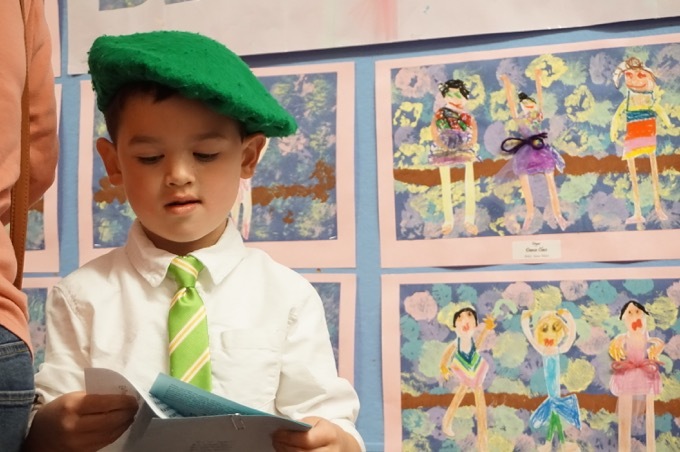 Your guide is very useful as well as entertaining. Picking up this blog again this year. Since my last comment post (back in November of 2011), I’ve lost almost 50 pounds. So, I have to say it again…if there is anyone out there who is reading this and thinking about taking up hiking, do it! Put the remote down and get off that couch! 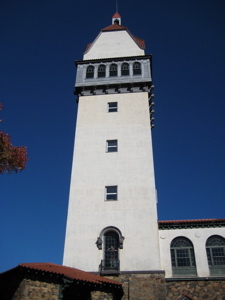 :) Anyway, just checking in since I’ll be heading up to the tower on Columbus Day again this year. Happy Hiking! You start on a smaller hill. 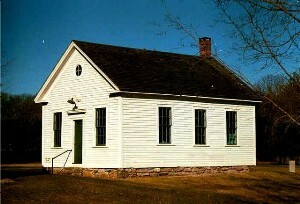 MUCH smaller. And, after months, maybe years of practice, you get to go some place like this. It’s heaven. On your first time some place like this, you look off the edge, and maybe your breakfast gets another pass across your taste buds. And you heart pounds. It is scary to yell “clear” and head out into space. But there are several videos and you can see people go off, hit the wind going up the cliff face, and gain altitude. Once you’re flying, all the worry goes away. It’s like you dreamed when you were a kid. But you really can look down and see the world. I fly in Calif. But I can tell you, looking at the Talcott Mt videos, I’m drooling. It really is beautiful. It would be very popular, if one didn’t have to carry a glider up the mountain. At 70 years old, I just don’t think that’s in the cards. The “dumb” alternate trail does serve a purpose. 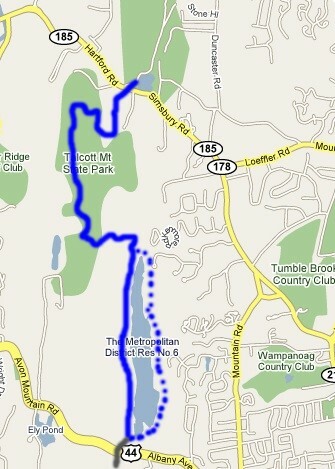 For people like me, who hike alone most of the time, I have to do “out and backs” or loops to get back to my vehicle. Loops are preferred and the “dumb” trail fits the bill perfectly.